Sports injuries may be a thing more commonly associated with adults but for children who play sport at a serious or semi-serious level, they are a very real problem. Even children who only play a little sport may be at risk of sports injuries – in fact, if their bodies are less used to the impact of playing sport, then they may actually be at more risk of getting an injury. But parents may wonder how they prevent and treat such injuries – after all, a child can’t be sent to the osteopath to click and crunch everything back into place the way an adult can. Evidently, as with all things of this ilk, prevention is far better than cure. Parents are advised therefore, to take all appropriate steps to prevent sports injuries in their children – and so that children learn from an early age what these measures are, and get used to doing them as they get older. Injuries are an inevitable part of playing sport – but there are preventable injuries as well, and the more of those which are eliminated, the better for all. Playing sport with an organised sports club is the number one way of preventing injuries. The adults who run proper sports clubs should be qualified coaches and will have appropriate first aid certificates. This means that they will lead warm-ups which are designed to help your child avoid injury and teach the children why this is important. Getting the correct equipment is another must-do for parents. Children’s bodies are still growing and forming and so ensuring their bones, muscles and tissue is protected properly is of paramount importance. Equipment cannot and should not be scrimped on. Whether this means a mouthguard and head guard for young rugby players or just the right type of trainers for an aspiring runner, the fact of the matter is that equipment has been manufactured to a certain specification to minimise the chance of injury – and should therefore be used. If your child does sustain an injury – and they will at some point, however well you protect them – then treatment will be needed. Again, in many ways, treatment for a child should be the same as for an adult. The difference will often be that the child will not know enough to not move the injury or put weight on it – this will be the difficult bit to instil in them. But always remember the RICE rule – rest, ice, compression and elevated. Of course, some injuries, such as broken bones, will require urgent medical attention. But sprains and strains should always follow these rules – keep them off the injury for 48 hours, ice it to reduce swelling, compress it for the same reason and then elevate it above the level of the heart for blood flow. The most common types of injuries which children are likely to sustain are sprains and strains – which is basically an injury to a ligament or a tendon or muscle. 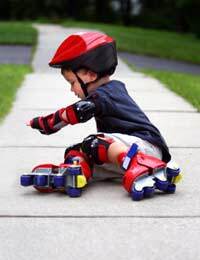 Adults get these too – but there are different types of injuries which children may sustain which adults do not. Children can injure their growth plates – the area of tissue which is still developing at the end of the longer bones. This is most common during early adolescence and should be particularly watched out for if the child is experiencing a growth spurt. One other key thing to be aware of when it comes to children and sports injuries is that children can become dehydrated even more quickly than adults so make sure any child playing sport, but especially in hot weather, drinks plenty of fluids. This also helps to prevent injury as their muscles are hydrated and ready for exercise.